Displays were set up at last night's public meeting on the Honolulu High-Capacity Transit Corridor Project at the Blaisdell Exhibition Hall. Lawrence Spurgeon, of the consulting firm Parsons Brinckerhoff, discussed routes for a transit system. Rail is the way to go. Just a bunch of meaningless drawings. These are a few of the reactions last night at the first of two public meetings in which the city introduced proposed ideas on mass transit alternatives. The meetings included four proposed rail routes for a 23-mile stretch between Kapolei and the University of Hawaii. 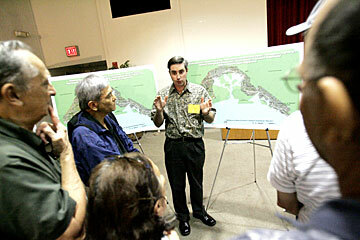 The forum at the Blaisdell Exhibition Hall was used to present the information and to take public comment. A similar meeting is set for 7 p.m. today at Kapolei Middle School cafeteria. "This is a format that we've used in other meetings. Some people like it, some people don't. I'm not sure there's a format that's perfect for everyone," said Mark Scheibe, project manager with Parsons Brinckerhoff Quade & Douglas, the consultant charged with producing a report analyzing the different transit options. Much of the public response to the ideas presented last night may not be known for some time. The city would not allow reporters to review written comments that were submitted. Mayor Mufi Hannemann addressed the crowd at the Blaisdell Exhibition Hall during last night's meeting about the Honolulu High-Capacity Transit Corridor Project. Another meeting is set for 7 tonight at the Kapolei Middle School cafeteria. The Star-Bulletin requested to see the public's blue comment sheets that were turned in but city officials denied the request. "These are public comments solicited by the (city) Department of Transportation Services and its consultant for our review," city spokesman Bill Brennan said. "These comments will become part of the public record and it will be integrated into the alternatives analysis which we are in the process of formulating tonight." At one point when a reporter was reviewing the boxes of public comment sheets, an official at the meeting collected the box and took them to another table. 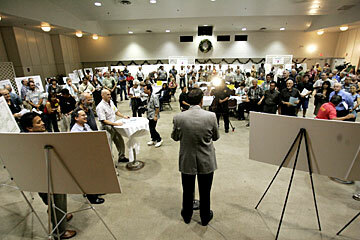 One person remarked that the meeting room at the Blaisdell Exhibition Hall resembled a science fair with display boards of information lined up around the room. People answering questions were stationed throughout the room. "The open format gives people an opportunity to gather information at their own pace, ask questions on issues that are particularly pertinent to them and then to make their comments at their own pace as well," Scheibe said. "The information on the boards were very clear. I liked the way they set things on a flow chart," said Chetana Acharya of Honolulu who moved here from the mainland three months ago. "All in all it was really nice to have all the visuals." But Henry Lee of Kaneohe said he thought it was just a bunch of drawings with little meaning. "I have more questions than I heard answers," he said. "This kind of leaves me empty. I would've liked to have these guys give a verbal presentation along with this, maybe slide show or something we can see. It doesn't grab me." Participants at last night's meeting were encouraged to write and submit comments about the proposals. Karen Awana, left, filled out a form offering her feedback. For more information online about the project, see www.honolulutransit.org. Jane Ellis of Salem, Ore., who visits Honolulu twice a year said she likes rail transit and is looking forward to Honolulu getting such a system in the future. Howard Hoddick of Hawaii Kai said that he thinks another freeway should be built. Bob Loy, director of environmental programs with the Outdoor Circle, said the organization is concerned about the affect a mass transit project will have on Honolulu's view planes and also about the way the public comment was collected. "We're uncomfortable that it's not the kind of process that would really allow for a good free public conversation about this issue and how it should be handled," Loy said. "It seems to have been designed in a way to limit public interaction and the ability for the public to create any kind of synergistic conversation that could result in a community consensus." Scheibe said this format was used because the city is in the early stages of selecting a mass transit option. "Further down the line, we will have a draft report to issue, people will have several weeks to read through it," he said. A report that analyzes the different transit alternatives is expected to be completed by November, with the City Council expected to choose one by the end of next year. Rail transit critic Cliff Slater said the way the public comment was gathered last night is another example of how the city is favoring rail transit in favor of other solutions. "Yes, I have my ideas but so do you and that's what we're interested in hearing from you," Hannemann told the crowd that numbered 400 throughout the three-hour meeting.